The city of Deephaven is still recovering from a civil war that wracked it and the surrounding Empire several decades ago. The war left behind many orphans and unwanted children, some of whom have grown up with thievery the only option for survival. After unwisely making a thief-taker his mark, one of these boys, Berren finds his life transformed as he is recruited as the thief-taker's apprentice. 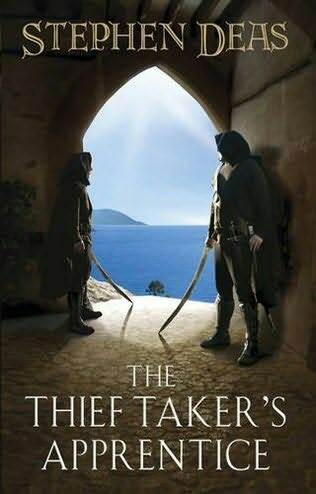 The Thief-Taker's Apprentice is the start of a new trilogy by Stephen Deas, author of the Memory of Flames Trilogy (The Adamantine Palace, The King of the Crags and the forthcoming The Order of Scales). It is set in the same world, apparently on a continent on the far side of the Taiytakei homelands, but a couple of mentions of the Taiytakei aside, there are no links between the two series (yet, anyway). It is also nominally a 'Young Adult' title, but Deas actually pulls few punches in the book to accommodate these younger readers. Particularly amusing (and actually effective) is the use of corrupted Cockney rhyming slang to get around restrictions on swearing, whilst the violence is not particularly sanitised (although not gratuitous, either). The book is pretty traditional. Whilst Memory of Flames has the politics of the dragon realms and the use of dragons as horrendous weapons of war going for it, The Thief-Taker's Apprentice is much happier employing standard tropes. We have a young main character (albeit one whose morality is a bit greyer than the standard young boy cliche), an older mentor (a disgraced nobleman from a distant land), the romantic interest, the nemesis and so on. Those looking for something surprising and new might be disappointed here. However, Deas takes the standard material and infuses it with great pace and some impressive depth, given the modest page count. The city of Deephaven, with its myriad districts, street gangs, commercial interests, sense of traumatic history and politics (seen here only at a far remove), is depicted very well, whilst there's some good character moments, particularly with Syannis the conflicted thief-taker and some minor characters like Kasmin. Berren himself and romantic interest Lilissa are less surprising, but likable enough as antagonists. Where the book falters is that it hints at some more interesting developments to come, but then ends just as the story gets going. Given the book's slight length, it feels like it could have been longer and pursued certain storylines further. 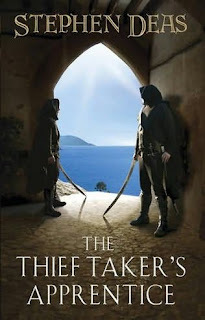 The Thief-Taker's Apprentice (***½) is a likable, enjoyable story but one that whets the appetite rather than fully satisfies. The sequel, The Warlock's Shadow, is due next year. The book is available now in the UK and on import in the USA. Sounds good, Wert. I'm in the market for YA fiction and this sounds like it's right down my street. Will get it one day!